Constructed of premium single layer nylon webbing. 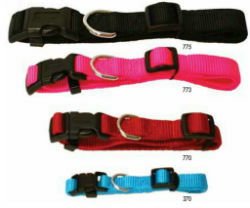 Features quick release buckle and end D-Ring. 3/8" x 8" - 12" 5/8" x 10" - 14" 3/4" x 14" - 22" 1" x 16" - 26"